Microsoft is about to invent the keyboard. 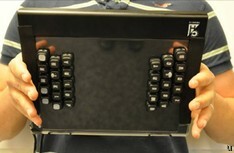 They are working on their own tablet device to compete with Apple’s iPad and they’ve built one with keys on the back. You can’t see what keys you’re hitting, but you see the letters come up on the screen. At first you’ll probably type out nonsense words, but their hope is that after a while you’ll get the hang of it.